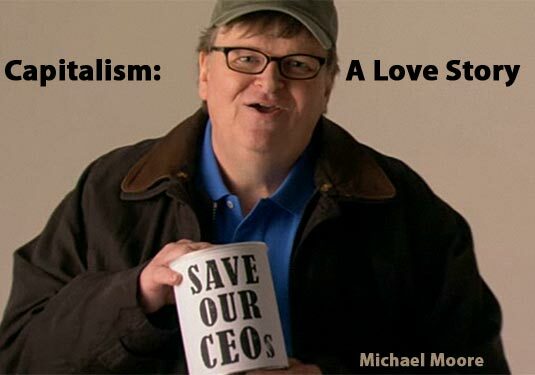 This weekend I went to see Michael Moore’s new muckraking documentary, “Capitalism: A Love Story”. To say that the title is ironic would be an epic understatement. Mr. Moore presents America’s current economic malaise within in a larger framework that is infuriating, hilarious, and heartbreaking, at times within the same scene. The movie is disparate and disjointed, but this not a problem. Tackling a subject as amorphous as capitalism requires historical vignettes, heartbreaking personal stories, newsreel footage, congressional speeches, staged protests, and the kitchen sink. All of this works to great effect. No one can walk away from “Capitalism” without an opinion on what Mr. Moore has presented on screen. I happened to be in a theater whose patrons were obviously sympathetic to Mr. Moore’s larger point that capitalism is an inherent evil. In service of forwarding this point, Michael Moore enlists some rather convincing figures. Choosing to juxtapose these powerful condemnations with scenes of the human carnage caused by the recession is extremely effective. Rather than going into an in-depth explanation of the complex financial instruments that facilitated the housing crisis, which precipitated the recession, Mr. Moore focuses on the frightening power that the richest top 1% wields over our democracy. Watching Congress, including usually respectable and principled members, break their necks to bail out the banking industry, despite the wishes of the populace, is chilling. Michael Moore covers much ground during the course of his brisk two-hour movie. Although you wish he would focus more attention on this aspect or that story, he does a wonderful job whittling the subject into compelling human stories and digestible nuggets of information that should resonate with the average moviegoer.